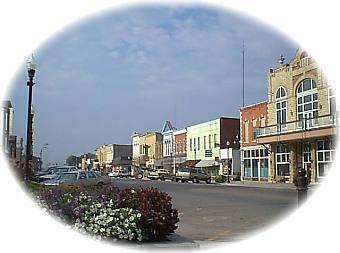 Wamego is a rural community of 4,500 that nestles along the fertile banks of the Kansas River. The pioneer fathers who carved this town from the prairies have left behind a legacy of history, progressive spirit and hometown tradition. History surrounds Wamego with reminders of the past in its charming downtown, and throughout the community in it's beautifully restored homes. The Columbian Theatre and Art Gallery is a historically renovated 19th century theatre which exhibits six rare paintings and other artifacts from the 1893 Columbian Exposition also known as the Chicago World's Fair. The Wamego History Museum and Historic Prairie Village, in Wamego City Park nearby is home to the Schonhoff Dutch Mill, listed on the National Historic Register, built in the 1870's and moved by horse drawn wagon in the 1920's to this site.The Wamego City Park is the perfect place for family picnicking, riding the minature children's train, fishing in the pond, or just taking a stroll. Oregan Trail followers can walk along actual trail ruts a few miles north of Wamego and visit the Louis Vieux Cemetery near the banks of the Vermillion River. Louis Vieux, a Potawatomie Indian once operated the first ferry along the Oregon Trail here. Wamego is internationally known for its OZ Museum and now includes the Oz Winery, Toto's Tacoz and an actual yellow brick road as part of its "must-see" activities. Come spend the day anytime, or see one of 'Kansas Best 150' 4th of July fireworks shows in the state, Tulip Festival, OZtoberFest, or the lighted Wamego City Park for a taste of what Wamego has to offer. Can't wait to see you! The story of The Columbian began over one hundred years ago. J.C. Rogers, a Wamego banker, visited the Chicago World's Fair, the 1893 World's Columbian Exposition. He was astonished at the beauty and scope of the event, celebrating the 400th anniversary of Columbus' discovery of the new world. Fabulous Finds on Hwy 99!